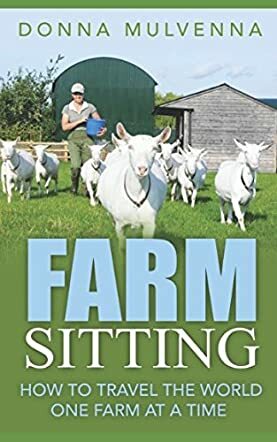 I was expecting Donna Mulvenna's book, Farm Sitting: How to Travel the World One Farm at a Time, to be anecdotal stories of life on other peoples' farms. Instead, I found a wonderful self-help guide to becoming a professional farm sitter. Donna Mulvenna briefly recounts her own story of how she came up with the idea of farm sitting for a living. Her well-ordered life took a major detour and she needed a new plan and some adventure. She was already familiar with how to take care of most farm animals, and apprenticed at a larger farm to learn more about machinery. After some initial mishaps, Donna became adept at everything she needed. The business of farm sitting grew to full-time inside of the first year. Ms. Mulvenna sold almost everything she owned and became a farm sitting nomad, branching out from Australia to a world-wide clientele, with many repeat customers. The premise of Farm Sitting: How to Travel the World One Farm at a Time is learning that farmers need vacations, just like everyone else, but where do you find a qualified farm sitter to manage your precious business and/or your precious animals? Where do you go to find someone trustworthy? What does the owner need to know to feel at ease leaving their property for days or weeks? Donna Mulvenna provides those answers. But she also covers what a farm sitter needs, how to find your niche market, legal ramifications, emergency contacts, including veterinary, pricing, suggestions for references, and suggested surprises for the clients for when they return. Things I would never have considered as a layperson were laid out clearly and concisely. It is obvious how much the author loves this kind of work, travel, and overall lifestyle. If anyone is considering farm sitting, he or she should start here. She also recommends this life for couples, wherein the clients would get a "twofer," making them feel doubly secure about their vacation plans.